Autonomous surface vessels (ASVs) have many applications in both military and civilian domains including mine countermeasure, seafloor mapping, and physical oceanography. However, to act as effective tools, ASVs require high levels of autonomy. Currently, many commercially available ASV’s have static mission plans with minimal awareness of their environment, which results in a labor intensive approach that does not scale to management of multiple vehicles. In this research, ASV autonomy was increased through the development of an intelligent mission planner and real-time obstacle avoidance system utilizing Electronic Nautical Charts (ENCs), which describe known hazards in the marine environment without suffering from the challenges of real-time sensor processing. A new algorithm called Depth-Based A* was developed as the mission planner, where the nominal A* search algorithm was expanded by utilizing a novel cost function that balances driving in the channel with taking the most direct route on an ENC-derived cost map. Although charted obstacles can typically be avoided through mission planners, they must still be accounted for in real time as other behaviors (i.e. avoiding uncharted obstacles or vessels) might cause the ASV to deviate from the planned path. The reactive obstacle avoidance system developed in this research reorganizes the ENC into a quick-search database where ENC-based obstacles in the ASV’s proximity are determined and avoided. These algorithms were tested with both a Seafloor System EchoBoat and ASV Global C-Worker 4 in simulation and in the field using an EchoBoat, where they avoided both concave and convex polygons. The algorithms developed in this research provide the ASV with a higher level of autonomy, potentially allowing for the same number of human operators to manage more ASVs. Sam Reed graduated from the University of New Hampshire in May of 2015 with a Bachelor of Science degree in Electrical Engineering. During his time as an undergrad, he was a member of UNH’s Division 1 Nordic Ski Team, was the Co-leader of the controls group of his senior project, and had three summers of internship experience. He spent two summers at the Timken Company working on an electro-mechanical testing device and one summer at NASA’s Marshall Space and Flight Center where he worked on a wireless motor controller for ground testing for two upcoming satellites. His senior project consisted of building an autonomous quadcopter in support of NASA’s Magnetospheric Multiscale Mission. 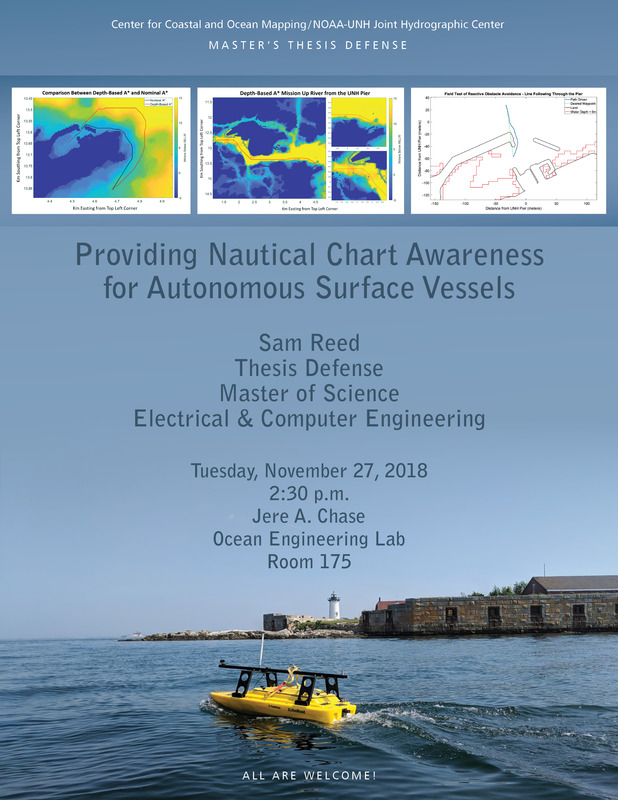 For his Master’s research, At CCOM, Sam worked with Val Schmidt on the controls of an Autonomous Surface Vehicle for ocean floor mapping.